Discover indulgent luxury on a private bay at this adults only all-inclusive resort. A preserved mangrove and ecosystem surrounds this lovely resort. 394 suites, including 60 swim-ups, feature modern styling and thoughtful amenities for your comfort and relaxation. Signature Royal Service suites offer discerning travelers an an elevated level of luxury, with butler service, exclusive suites with terrace whirlpools, private Lounge, beach, pool and bar access, and priority spa reservations. 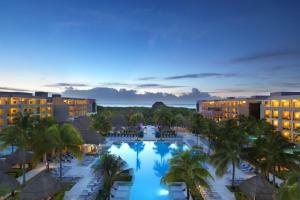 The hotel features a lagoon-style pool, a full-service spa, 14 restaurants, 16 bars and numerous sports programs.